Maurice Baxter (Service No 2882) was born in Sussex, England. At enlistment, Maurice was single, 23 years old, worked as a butcher, and lived in Bulli, N.S.W. He embarked from Sydney on HMAT A71 Nestor with 6th Reinforcements, 30th Battalion, on 9th April 1916. He arrived in England on 16th June 1916 and was a welcome reinforcement to the 30th Battalion on 26th September 1916, missing the battle of Fromelles, but serving on the Western Front. Maurice was evacuated to hospital in England for treatment of trench feet and spent 1917 serving in England. He returned to the 30th Battalion in France on 10th April 1918 and served until the war ended. He engaged in civilian employment and training in England from 1st February 1919 until 31st July 1919. 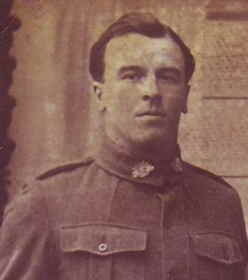 Maurice returned to Australia in September 1919 and was discharged from the AIF on 16th December 1919. On 9th April 1921 he married Muriel Floyd in Wollongong, N.S.W. and they had 3 children. Maurice died in 1965. He is commemorated at the Thirroul-Woodward Memorial Park.